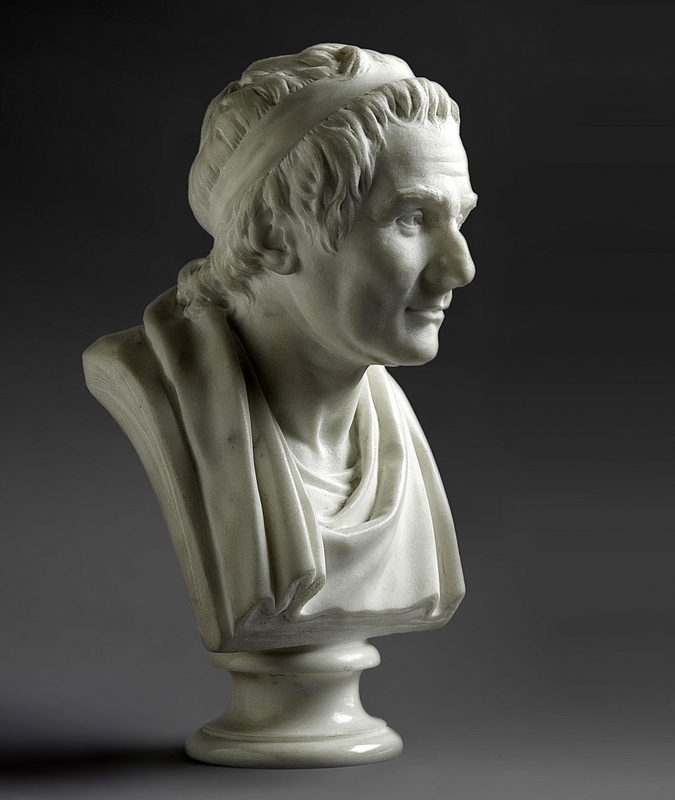 French Eighteenth Century sculptor Jean-Antoine Houdon (1741–1828), bust of Jean-Jacques Rousseau in Serevezza marble, signed and dated “houdon f 1788,” and 10-4/5 inches, sold at $778,800, making it the top lot of the auction. They were acquired in 1926 from the Paris dealer Paul Gouvert by the Honorable Irwin B. Laughlin (1871-1941), an American diplomat who served in the State Department from 1903 to 1932. Laughlin was appointed ambassador to Spain and served from 1929 to 1932; it was during this posting that he formed an extensive collection of French Eighteenth Century drawings, with help from Agnews Gallery, London, and Comte Enrico Bosdari (known as Henri Brémont). Upon his return to the United States, Laughlin built his home in Washington, DC, called Meridian House, by John Russell Pope, in the Louis XVI style; Laughlin also assisted in the planning of the West Building of the National Gallery of Art, where many of his drawings and other collections were eventually donated. His collection was preserved by his widow Therese Iselin Laughlin until her death in 1958, when it was inherited by their only child, Gertrude. Much of it was sold in 1959, however, the busts were not recorded for the sale and remained unrecognized until Cottone collected them for this auction. 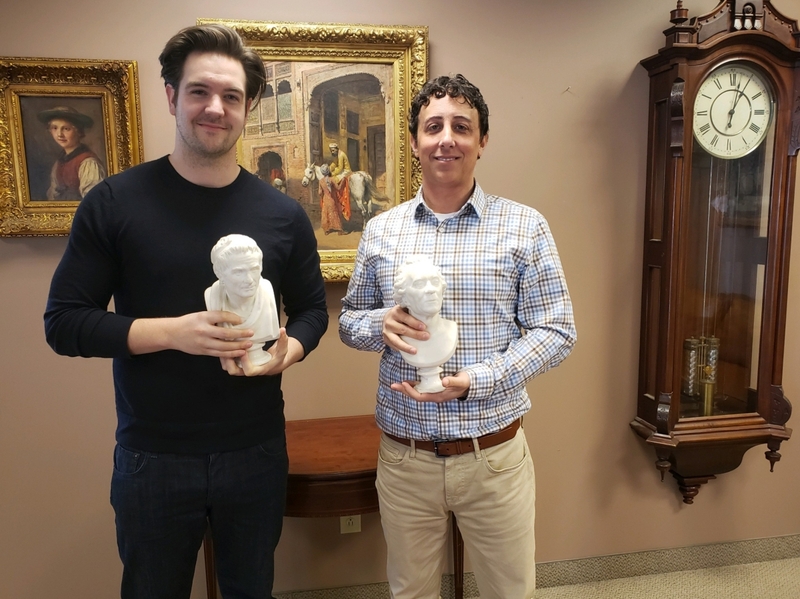 The two Houdon busts, both of which are recorded in the Frick art reference library in New York, have passed down through Laughlin’s descendants. The busts were rediscovered, remarkably, at an estate in Geneseo, N.Y., where, Cottone said, they had been overlooked in a 2000 estate appraisal by a New York auction house. The busts were the top achievers in an auction that featured just over 300 lots. 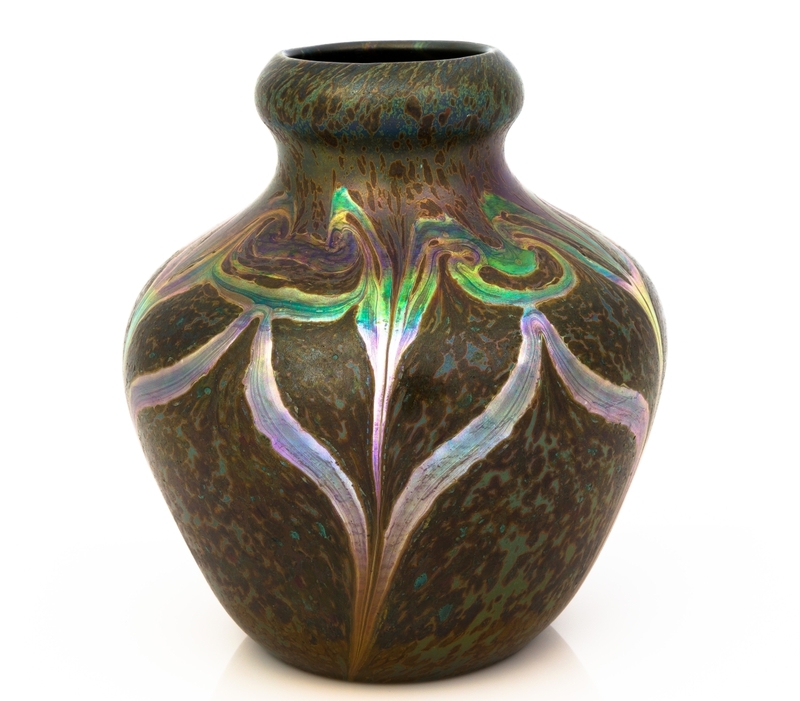 The auction overall included fine art, Tiffany lamps, Twentieth Century art and design (which was sold on behalf of the David Anderson Grandchildren’s Trust in Buffalo, N.Y.), as well as decorative arts, furniture and Asian objects. 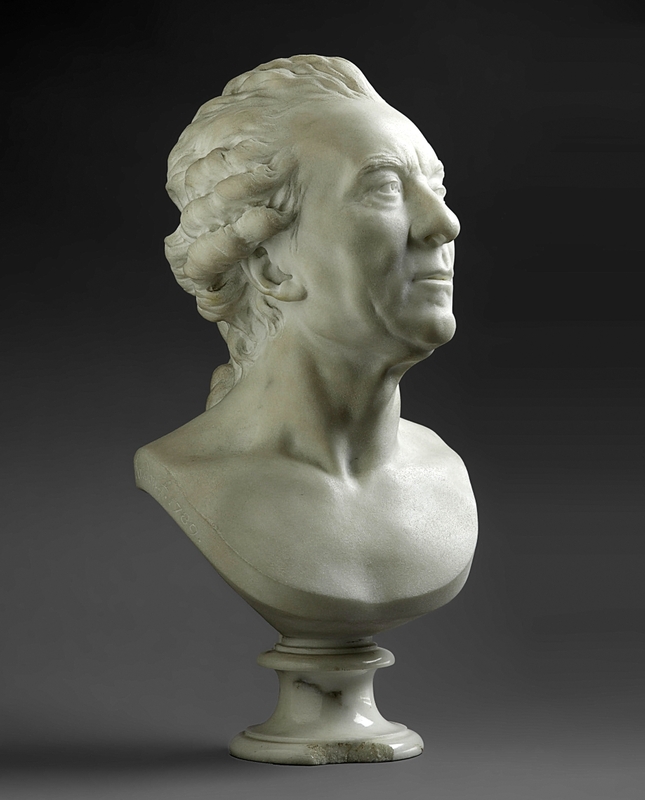 Jean Antoine Houdon (French, 1741-1828), bust of Georges-Louis Leclerc, Comte de Buffon, 11- inches, signed and dated “houdon f 1789,” was the second top lot when it sold at $696,200. “The Houdons aside, it was a very successful sale,” Cottone said. One other lot reached the six figures. It was a rare set of nine Chinese blue and white Eight Immortals bowls, each 2 inches tall and 4¼ inches in diameter and carrying the six-character Daoguang character reign mark (1821-50). The bowls were decorated with the eight immortals in clouds over swirling waves, with the center interior depicting the three star gods and sold at $118,000. 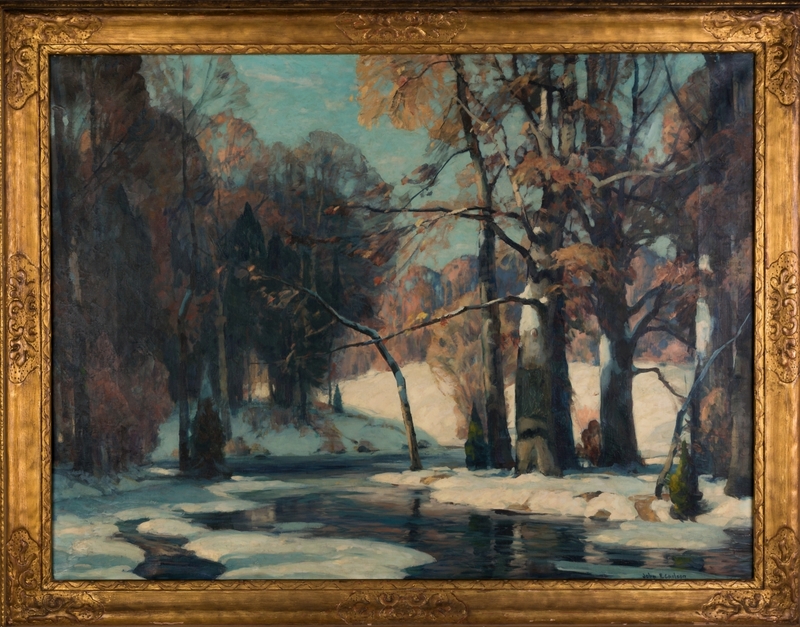 An oil on canvas winter scene by Aldro Thompson Hibbard (American, 1886-1972), purchased directly from the artist’s wife, was signed lower left. The 40-by-50-inch work, which Hibbard donated for a baseball team benefit at the Rockport Art Association – thus becoming known as the “baseball painting” – realized $43,600. The raffle winner sold the painting back to Hibbard where it remained for the rest of his life. 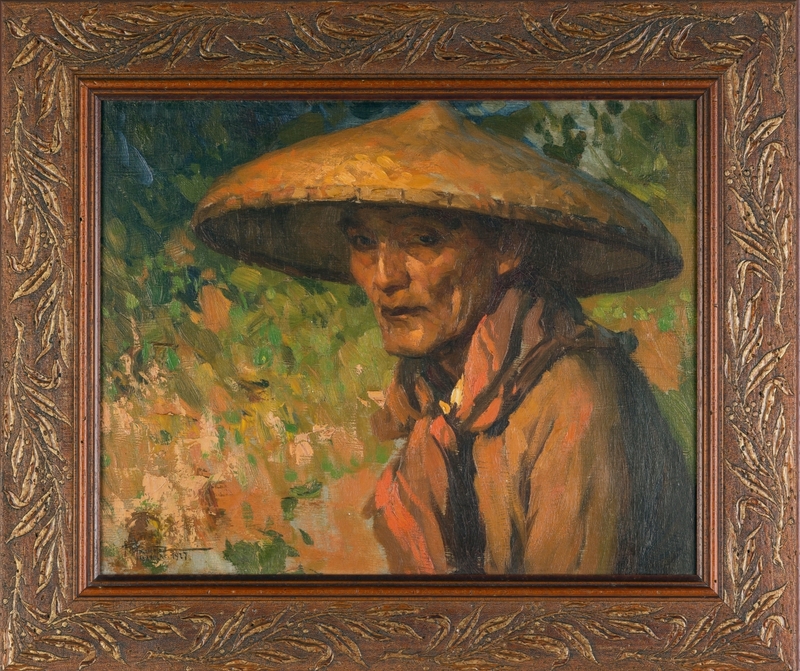 Another painting was also hotly contested, an oil on mahogany panel depiction of a man in a hat by the Filipino artist Fernando Cueto Amorsolo (1892-1972), who is best known as a portraitist and painter of rural landscapes and for his mastery in the use of light. 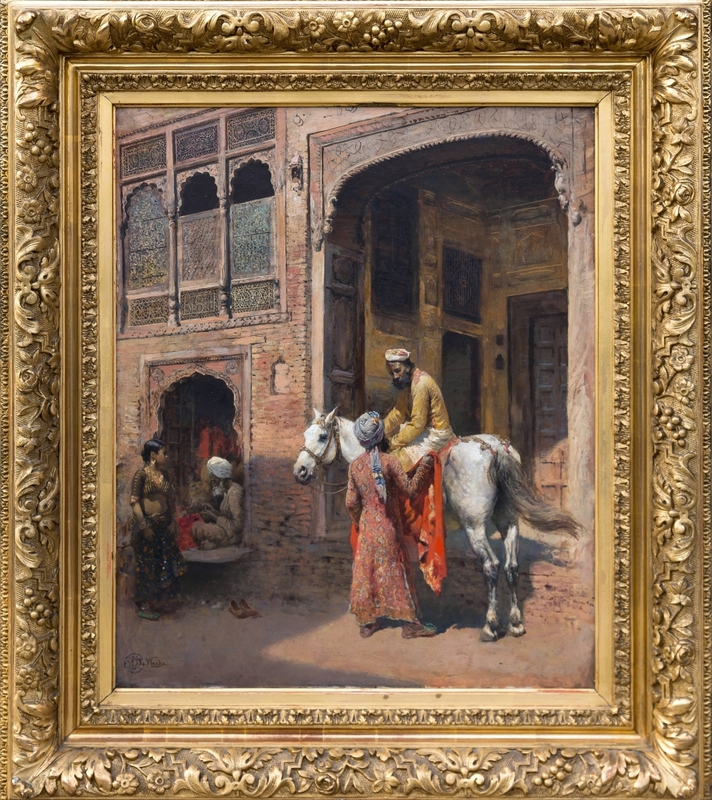 This painting was done in 1927, and it sold above its $15,000 high estimate at $26,000. 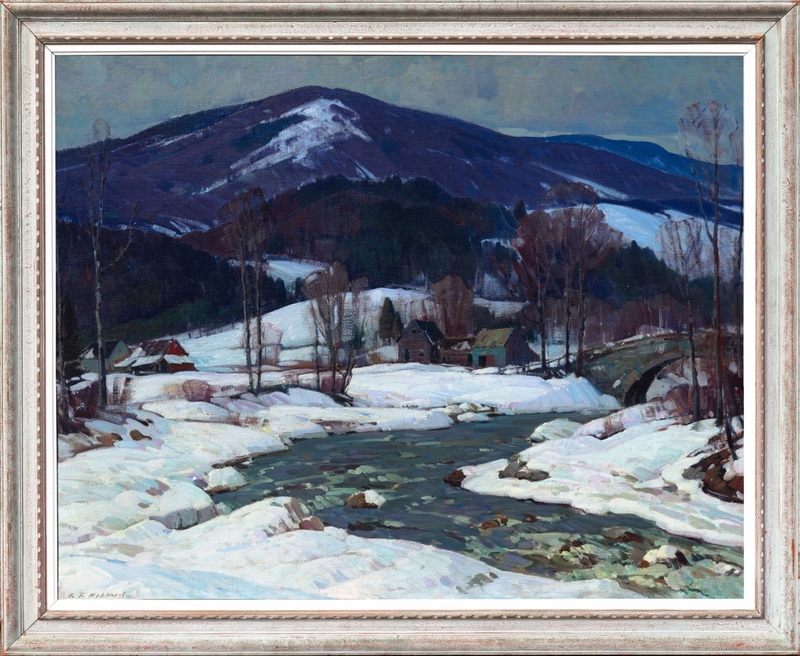 Also, an oil on canvas winter landscape by John Fabian Carlson (Swedish American, 1875-1947), signed, 30 by 40 inches in the original frame, changed hands for $22,400. “Tiffany collectors and people who love it did some heavy bidding. Tiffany is a hot category right now, and we had Tiffany lots that were just right,” Cottone said. 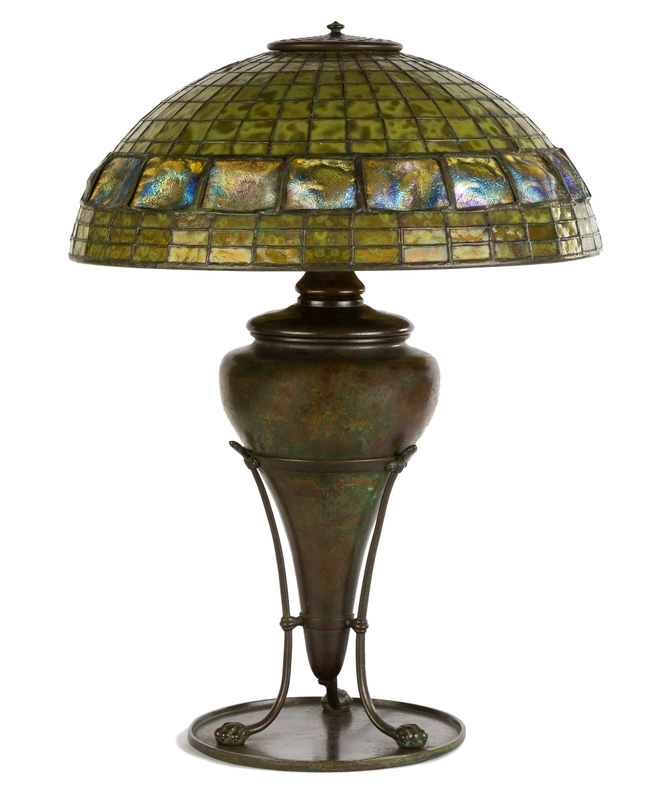 Several beautiful Tiffany Studios New York lamps illuminated the room before finding new homes, including a Bamboo table lamp that realized $85,500; a leaded glass and patinated bronze Arrowroot table lamp with a 14-inch shade sold well at $62,500; and a Turtleback table lamp lit up at $44,800. 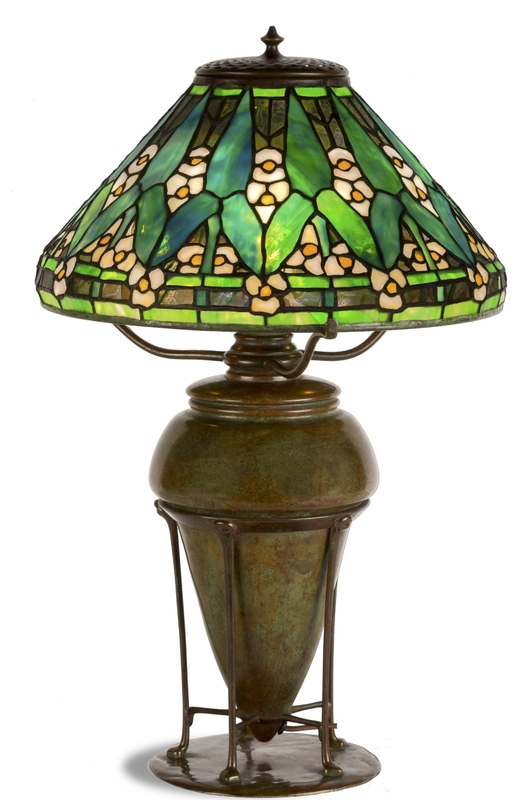 It was not just lamps by Tiffany Studios that attracted a great deal of interest. 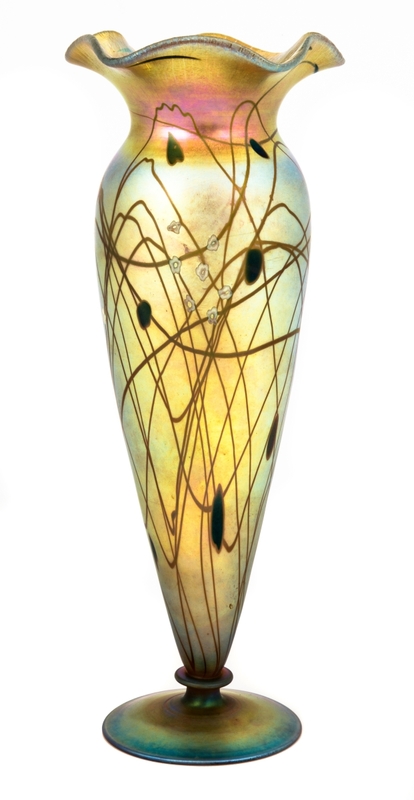 Other Tiffany creations caused a stir, like a fine and rare decorated Cypriote vase, manufactured circa 1899, with the rough surface textures resembling the decomposed surfaces of Roman glass buried for centuries that sold at $36,600; and the circa 1910 side table, boasting a brownish-green patina and handsomely made from quartersawn oak, that realized $31,800. 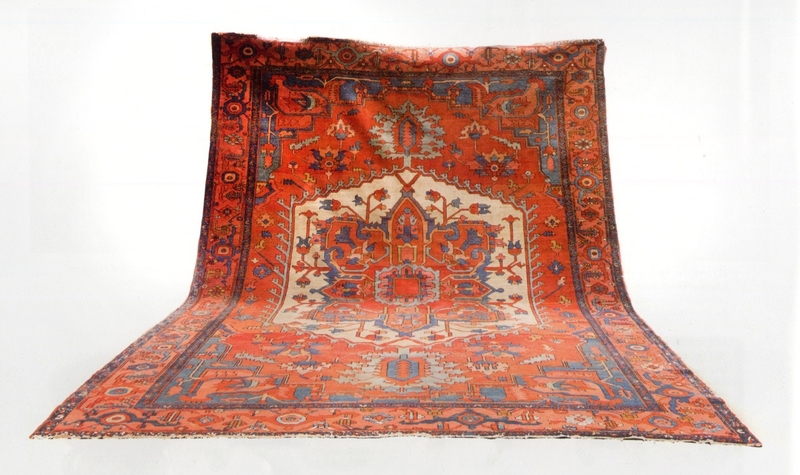 Other highlights of the day included a Steinway Model B piano with ebony veneer selling at $35,500; a late Nineteenth Century Serapi rug measuring 12 by 10 feet, going to a new home for $17,100; and a rare Steuben Aurene and Millefiori decorated vase, 14 inches tall, decorated with leaf and vines and a ruffled top and signed “Aurene Haviland,” brought $6,500. Prices, with buyer’s premium, as reported by the auction house. 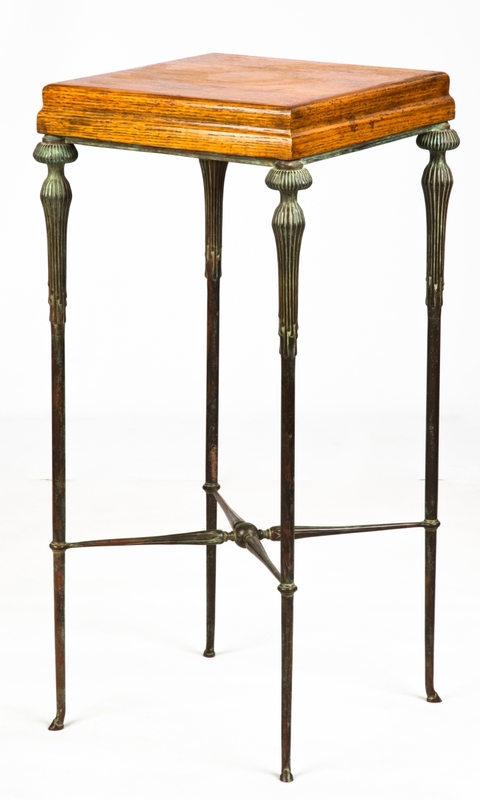 Cottone’s next art and antiques auction is scheduled for May 18. 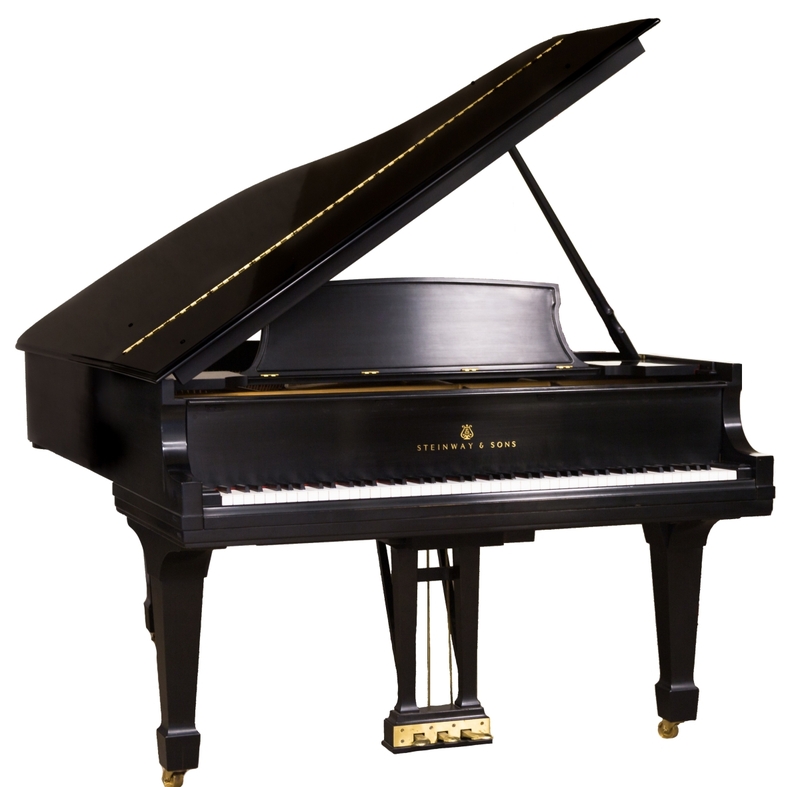 For more information, www.cottoneauctions.com or 585-243-1000. 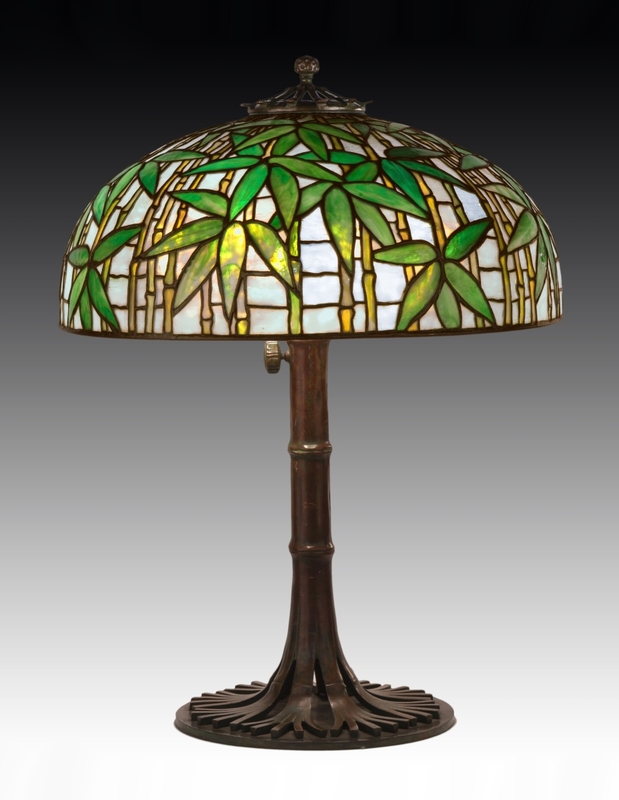 A Tiffany Studios New York Bamboo table lamp with an adjustable bamboo base, with both shade and base marked Tiffany Studios New York, set the stage when it sold at $85,500.